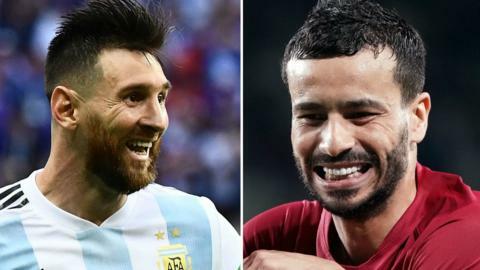 World Cup 2022 hosts Qatar will play Argentina at this summer's Copa America in Brazil. Paris St-Germain forward Kylian Mbappe injures a shoulder as world champions France beat Uruguay in a friendly in Paris. A controversial Neymar penalty earns Brazil victory against Uruguay in a fiercely contested friendly at Arsenal's Emirates Stadium. Belgium move to the top of the Fifa world rankings alongside World Cup winners France - the first time two teams have shared the top spot. Watch all the best action from match day 20 of the 2018 World Cup in Russia, as Belgium take on Brazil and France face Uruguay for a spot in the semi-finals. What is 'mate' and why do so many footballers drink it? Read more on What is 'mate' and why do so many footballers drink it? Who is playing? How can you watch? Who does our expert think will win? Everything you need on day 17 of the 2014 Fifa World Cup. Brazil thrive on momentum and pressure but Argentina, Germany and Netherlands are all capable of destroying their dream. No Suarez questions allowed and no speaking English - BBC Sport's Ben Smith reflects on an unusual day with the Uruguay camp. "Four hundred journalists turned their heads in collective disbelief - did he really just do what I think he did?" Who is playing? How can you watch? Who does our expert think will win? Everything you need on day 13 of the 2014 Fifa World Cup.